For 45 years, Prevent Child Abuse America has helped lay the groundwork to deliver great childhoods to children nationwide. Since 1982, the sisters of Sigma Delta Tau have played a huge role in helping them achieve their mission and vision of a world in which no child is ever abused or neglected. Through fundraising and awareness events, SDT sisters and alumnae are helping Prevent Child Abuse America make an impact nationwide through key programs and focus areas. Your support allows Prevent Child Abuse America to help parents, caregivers and communities create safe, nurturing environments for children through their signature programs, education, research and advocacy efforts. 50 State Chapter Network promotes services that improve child well-being and develops programs that help prevent all types of child abuse and neglect. Healthy Families America evidenced-based voluntary home visiting program strengthens families, promotes healthy child development and improves family functioning. Educational resources, from child safety to social and emotional development to child bullying, help parents raise happy, healthy children. Research in child abuse and neglect prevention strengthens our programming and resources to help build strong families and communities. Advocate for local and national policies that promote child well-being and support family self-sufficiency. 94 cents of every dollar goes directly to fund their programs! The core fundraising initiative for PCAA revolves around the Pinwheels for Prevention campaign promoted in April (Child Abuse Prevention Month). 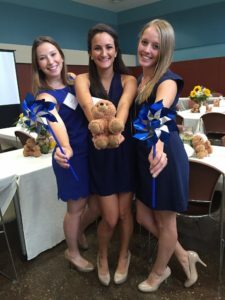 SDT chapters nationwide participate in pinwheel projects on their campuses by selling and displaying pinwheels. 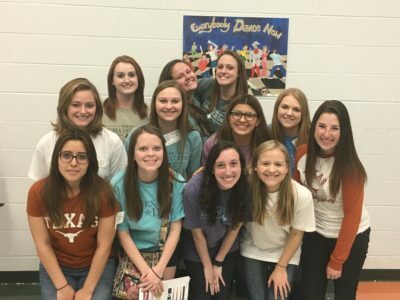 In addition, many chapters host events and activities throughout the year, from dance marathons to bake sales. We’re working hard to DEFΣΔT CHILD ABUSE! Over the past 35 years, chapters have raised more than $3 million! Sigma Delta Tau underwrote the development of Empower YOUth, the collaboration between PCAA and the Butler University College of Education. This program allows collegiate women to serve as role models through Girls Inc., a national leader in outreach, education, and support, encouraging girls to be strong, smart and bold. Empower YOUth is formatted to help improve social and emotional competencies and positive relationship skills among middle school girls, The hope is that this curriculum will be embedded within a current Girls Inc. program and SDT collegiate women will facilitate the activities as an enhancement. Activities have been developed that aim to increase the five core principles of social and emotional learning (SEL): self-awareness, self-management, social awareness, responsible decision-making, and relationship skills. Research demonstrates that focused development of SEL in students will positively contribute to protective factors, promoting healthy student growth and development, and safer and more supportive learning communities. PCAA is rated one of the two best charities for children in the nation by Consumer Reports! SDT alumnae are invited to join with the Sorority to raise funds or volunteer services. Please contact nationaloffice@sigmadeltatau.org if you would like to get involved. For more information on SDT’s National Philanthropy, visit http://preventchildabuse.org/.